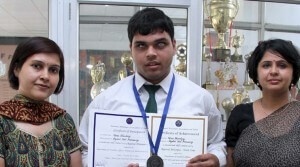 These lines typify 18 year old Tapas Bhardwaj who despite being visually impaired scored a stupendous 91.4 % in CBSE class XII Board exams. With a 457 of the maximum of 500, Tapas was just 37 marks behind the XII board topper. It too a whole lot of courage and determination on part of Tapas to compete with the best and the brightest in the country successfully. A student of Delhi Public School, RK Puram , New Delhi. Tapas would put in 7-8 hours of study. In his preparation he used a computer which would convert the text to speech, which Tapas would listen to intently and ingrain the concepts. In class while his class mates took notes with pen on paper, Tapas would key in the key lecture points into his laptop. His mark sheet reads English Core-95, Psychology-90, Sociology-95, Legal Studies-94, Computer Science-83. His sixth subject was Hindustani Musical Vocal in which he scored an impressive 92 marks. Tapas has already cleared the CLAT exam and is all set to pursue a law degree. With his grit and determination we know Tapas will make a fine lawyer. Branolia wishes Tapas all the best in his future endeavours.